This is the outfit i wore today, i love my vintage sandals, i picked them up in the summer from Brighton. I am just looking forward to the summer, and seeing the sun everyday will just be bliss. 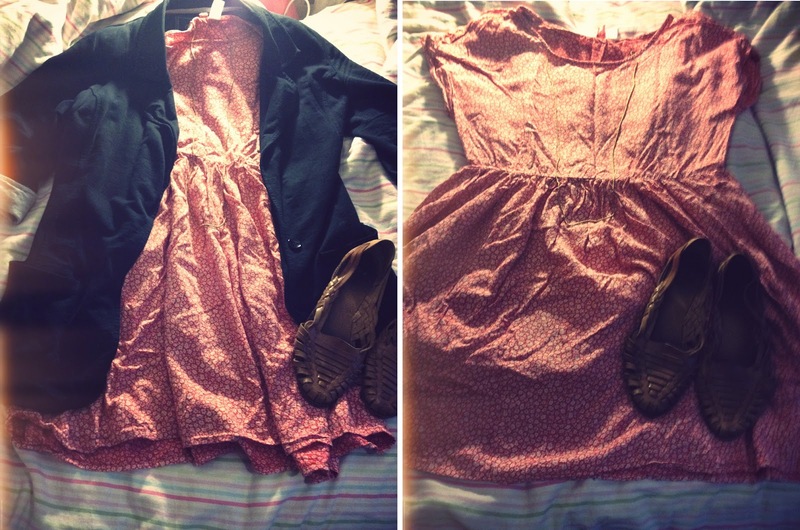 This is my favorite dress yay for second hand. On Sunday we had a massive clean up at home that has resulted in selling lots of lovely things on ebay i have been spending last night editing the images, i love spring cleaning.Today was busy busy as always at work, wednesday are always my worst day off the week, not really sure why i have never liked wednesdays ha! I am working on a few things for the blog, i am feeling really inspired at the moment, be prepared to see lots of new projects. Ooo and there maybe a Give away coming up. Previous Post weekly work Outfits. Next Post weekly work Outfits. Such a sweet outfit and I can't wait to see all the things in the coming weeks. What is your seller name on ebay I wouldn't mind a peek at what you have for sale when you put them up. Lovely outfit! I especially dig the shoes – such a good find! Lovely lovely lovely Ella! I adore this outfit so much. It's so perfect for summer.. I envy your jewellery and clothes!